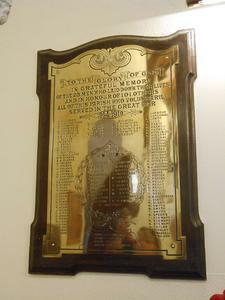 A brass plaque with decorative details at the top is framed on the wooden back board. Under the decorative details, there is a sentence in caps, written 'To The Glory of God' in the space of ribbon pattern. The year of the war is kept in the decorative pattern where below the inscription. The wreath is placed in the middle of the plaque with decorative design and written 'Faithful Unto Death' in the space of ribbon pattern. Two columns of names are in the middle of wreath and another 4 columns of names around the wreath. The quotation is at the bottom of the plaque. Names are in alphabetical order in surnames. Lettering are in caps and carved. TO THE GLORY OF GOD / IN GRATEFUL MEMORY / OF THE 23 MEN WHO LAID DOWN THEIR LIVES / AND IN HONOUR OF 101 OTHERS / ALL OF THIS PARISH WHO VOLUNTARILY SERVED IN THE GREAT WAR / 1914 – 1919 R.ALLISON J. LARMOUR / W.E.M. ARMSTRONG E. LARCOMBE / W. ARMSTRONG G.HILL J.JOHNSTON E. LOWRY / T.ARMSTRONG V.HOUSTON G.KIRKPATRICK J. LUNN / S. ARMSTRONG C. HUSTON D. KIRKPATRICK R.MAGEE / F.ARMSTRONG J.IRELAND K.C KIRKPATRICK H.MAXWELL / R.W.H.BLAND R.IRELAND I. KIRKPATRICK B. MAXWELL / F.BARNES I.IRELAND A.LARMOUR D.McCAUSLAND / JAS BOYCE R.McCURRY / E.BOYCE A.McCURRY / J.BROWN S.McCONNELL / J.BROWN L.McCONNELL / S.BRUCE S.McCONNELL / D.CAMPBELL E.McCREA / H.J.St.J.CLARKE / J.McFADDEN / B.R.CLARKE A.McILWAINE / S.S.CLARKE J.McILWRATH / R.COLGAN R.McKEOWN / T.COLGAN P.McLAUGHLIN / J.COLGAN W.J.MONTGOMERY / J.CRYMBLE T.MONTGOMERY / G.CRYMBLE H.MOORE / R.DAVIDSON J.PORTER / I.DOHERTY D.PORTER / R.E.DUDGEON W.REILLY / S.DUBOIS R.REILLY /R.DUNN G.REILLY / W.DUNN T.REILLY / J.EDGEWORTH T.ROSE / J.ELLIS A.M.SEABROOKE / J.FEE J.SCOTT / C.FENTON R.SLOAN / J.FRYAR H.SMYTH / W.GEARY M.SMYTH / J.GILMORE T.SMYTH / D.GIRVAN G.SPEERS / A.GREER I.STEWART / R.GREER R.STEWART / W.J.HALE D.STEWART / H.H.HALE A.TAYLOR / T.J.HAMILL J.TINSLEY / D.HAMILTON J.T.WADDELL / JAS HAMILTON J.S.WILSON (In the centre) THESE GAVE THEIR LIVES / R.T.BLEAKLEY R.J.KEMPTON / Jn.BOYCE J.McNEILLY / W.J.BLAIR R.McGLUGHAN / L.B.CAMPBELL J.PATTERSON / JOsDUNN W.PORTER / JEr.DUNN J.SCOTT / S.FENTON T.SCOTT/ G.GALBRAITH G.SMYLIE / W.GREER W.SMYTH / H.HAMILTON H.C.STEVENSON / G.M.HUSTON R.STEWART / G.WHITTLEY / FAITHFUL UNTO DEATH / DOROTHY GRAINGER V.A.D. /DOROTHY HUSTON / MARY TAYLOR / SISTER ELIZABETH TINSLEY. 1) 'Carved in Stone' ISBN 0-9254698-04-1 by the Belfast branch of the North of Ireland Family History Society, C/O School of Education, Queens University, 69 University Street, Belfast BT7 1HL, 1994. 2) www.irishwarmemorials.ie (Irish War Memorials) recorded by Johnny Conn, 15 February 2007.